Reappear in my life anyway, however briefly. It’s such a simple pattern but I think it’s so pretty! Of course you can mix up a disappearing 9 patch block (D9P) to look haphazard and interesting, but I think my eyes like order. Can you see the difference? 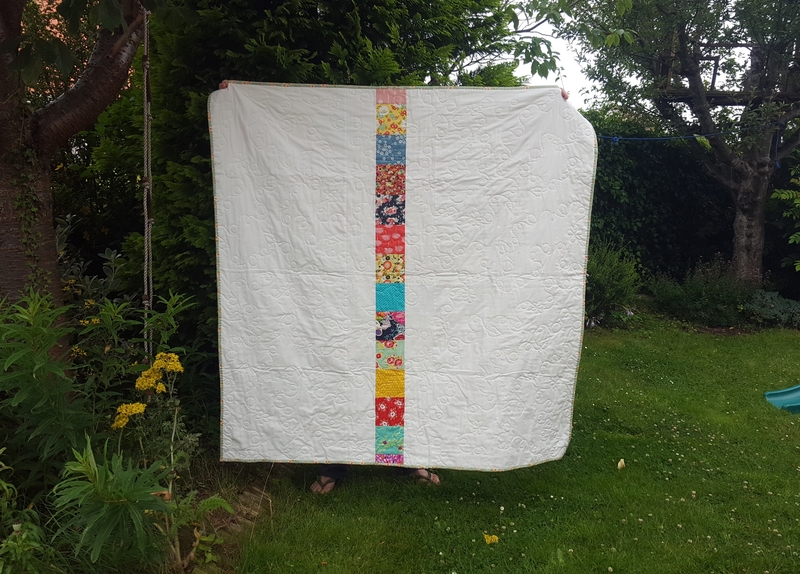 Apart from the colours, I literally used eighty 5″ squares (2 charm packs) and had none left to make a couple of borders to make it symmetrical. 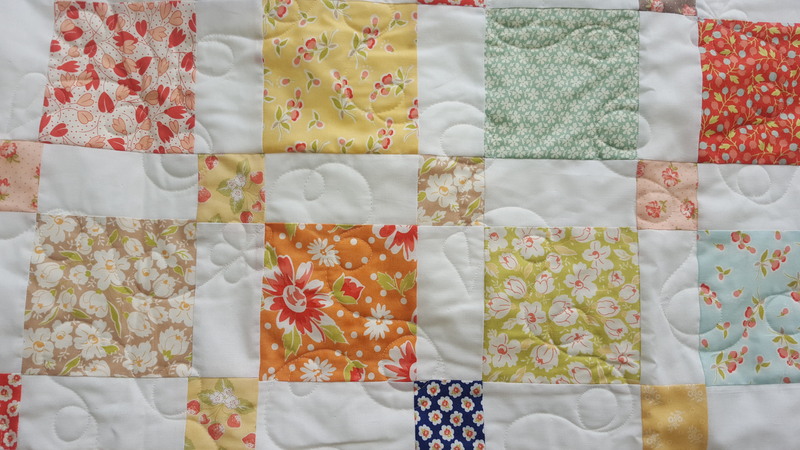 This time I did, as I used leftovers from various recent projects, including my Fig Tree Twirl quilt. It makes a difference doesn’t it? 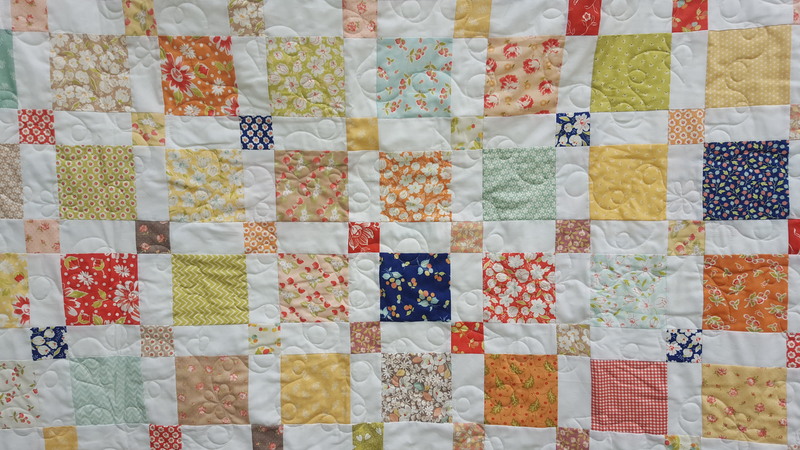 You can see I just made a strip of 2.5″ print squares joined alternately to 2.5″ x 5″ white rectanglesand joined it to the side of the quilt top I’d made (from the tutorial). And then made another and joined it to the bottom. You need 15 2.5″ print squares and 16 2.5″x 5″ white rectangles. And then I put a 2.5″ wide wide border round the outside. 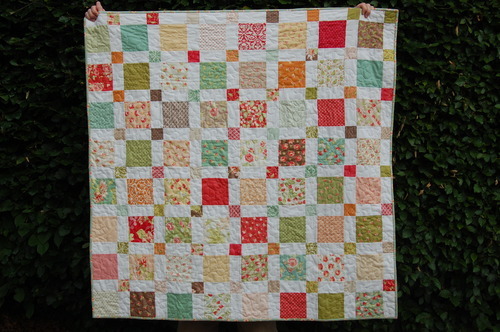 The quilt then finished at 58.5″ rather than 52″ which is a nice size. When I was putting the binding on I reflected that adding another 2.5″ print border next to the white border would be lovely – if I make another that’s what I’ll do! I used a charm pack of Coney Island by Fig Tree & Co for Moda, and leftover charm squares, mainly from Strawberry Fields Revisited and “Fig and Plum” – now a very old line. It all works though. 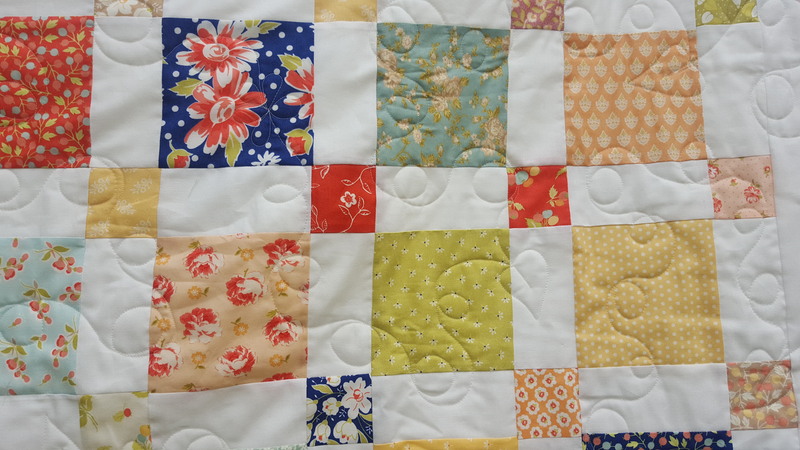 I don’t know if you can see the quilting well, but I did loops, leaves and flowers, fairly loosely (because my batting lets me and I’m on a deadline, so needed to be quick). I’ve been waiting for 3 months for a batting roll – I knew it would take that long as it’s quilters dream orient which needs ordering – I think it’s so expensive that it’s not that popular here. But it is glorious stuff and my favourite. Anyway it arrived – yay! And I’m ready to quilt ALL the things! 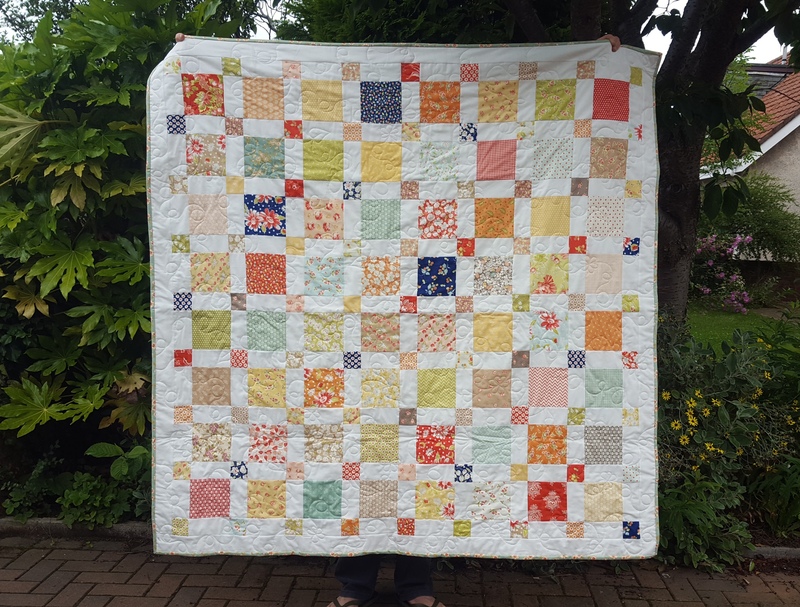 This quilt is destined for one of the survivors of the Grenfell Tower tragedy in London a few weeks ago. I’m going to try not to write about it here (as I get so angry about how politics and cost-cutting is costing lives, you can read about the tragedy online if you like) but most people in the UK have been in deep shock about it. Quilters, being generally kind people, being no exception. 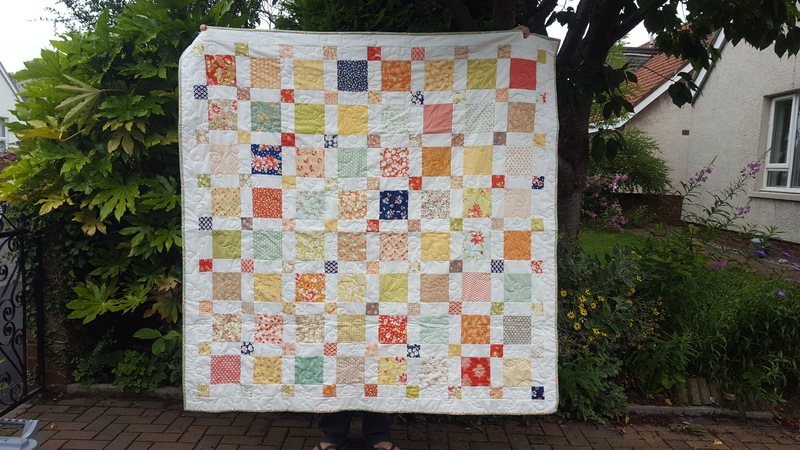 Mx Ruby Rouge on Instagram started a quilt drive to try and provide quilts for people who have lost everything – sending a physical hug, telling people that we care. There is now a hard working team of people who have organised drop off points, couriers, wadding and fabric donations, long arm quilters working for free, all kinds of things across the country. The number of shops who have donated is amazing. It makes my head explode at the logistics and the kindness, but it looks as though 1000 quilts have been donated or pledged. Including my small offering. You can see more on Instagram under the hashtag #quiltsforgrenfell but the whole thing has been organised through a closed Facebook group. It’s heartwarming. And devastatingly tragic. Anyway enough! It’s the school summer holidays so I must leave my online hideaway of creative folk and prettiness.